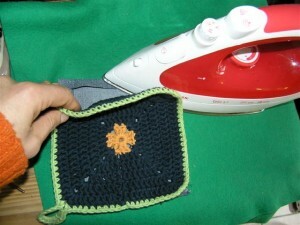 I love crocheting potholders. They’re great instant gratification projects, and are perfect to use up small remnants of cotton yarns in all colors of the rainbow, making great gifts on top of all. But. Sometimes I’m not patient enough to crochet twice the same pattern and make them double-thick, resulting in potential burned fingers.. which undoubtedly goes against the initial purpose of potholders. 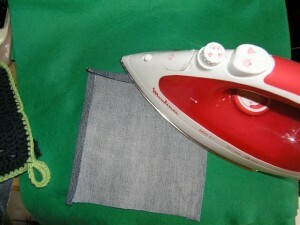 1/ First, gather your materials: if using a pair of jeans, cut leg to have one layer of fabric. 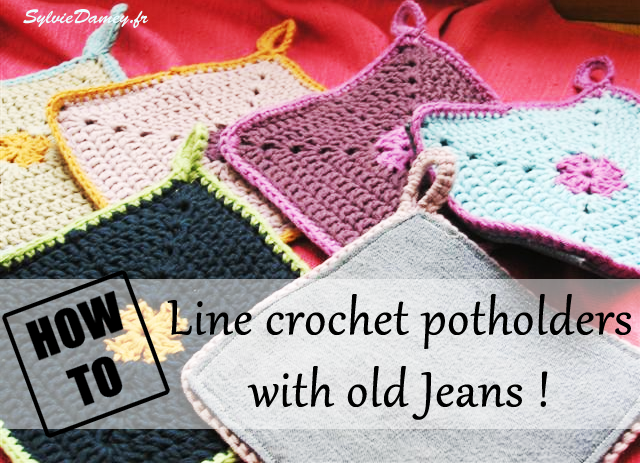 Use the best part of your jeans: forget about those used-up knee areas or your lining would not help much ! I used a rotary cutter, but you may use regular scisors. 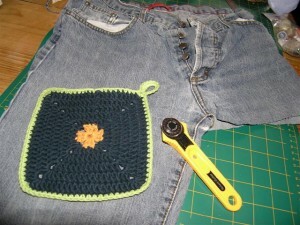 2/ Draw the outline of your piece of jeans, approx 1 cm – 1/2″ around the edges of the potholder. 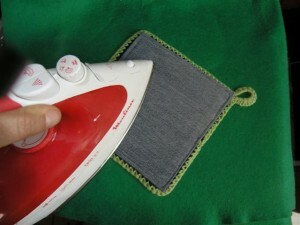 This will give you space to fold the raw edges of the jeans fabric inside. Cut along the drawn shape. Don’t worry too much if your shape is not perfectly square. 3/ Turn jeans piece with wrong side up, fold edges about 1 cm – 1/2″ along 2 sides and press. 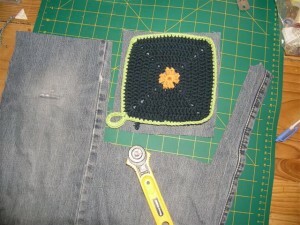 4/ To get as close as required measurements as possible, place your potholder on top of the piece of jeans with 2 folded edges, and fold and press the remaining 2 sides according to desired size for your lining: keep in mind that you want the lining to sit as close as possible to the actual edges of the potholder. 5/ This is looking good: one potholder and lining, ready to be assembled ! 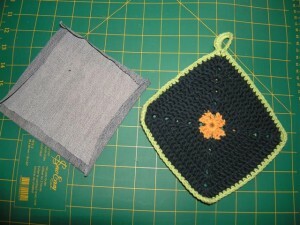 6/ Place lining and potholder face to face, with wrong sides together. Pin if desired (I like to free-hand it). 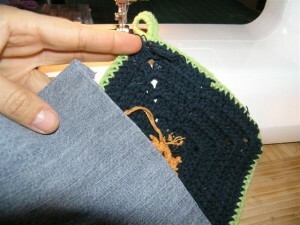 7/ Sew around, on lining side (needle would totally get jammed if sewing on crocheted fabric side). 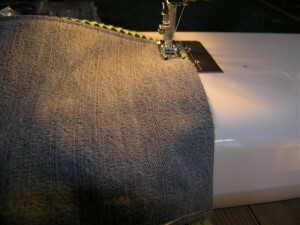 Use a special needle if you have one, to sew thick fabrics/jeans. Sew using a straight stitch, not forgetting to secure your seams at beginning and end (sew forward for a few stitches, then backwards and forward again). Smart! I was wondering what to do with my old jeans!